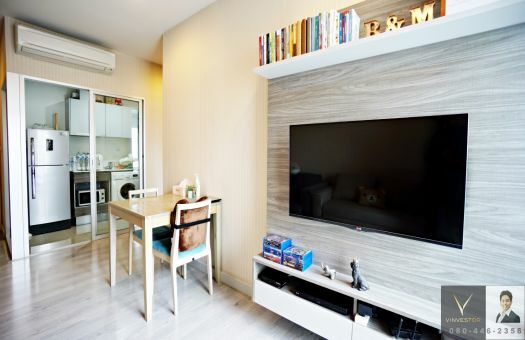 - Chambers Ramindra Condo This unit is located on the 7th floor. The East is the best location of the project because there is no noise from the football field and it is sunny in the morning. Fully furnished with beautiful built-in furniture. Ready to go. - Condo for sale. With functional design and spacious living space. It also provides full facilities. Parking is 100% fully accessible to both. Kaset-Nawamin Road and Outer Ring Road Near Ramintra Expressway And BTS the pink line. - The owner of the room rarely. The room is so new. - Project Type: 3 low rise condominiums, 7 floors, 152 units, 4 rai, 23.00 sq.m. - Central Charge ฿ 45 per sq.m. - Sin Medical Hospital: 4.5 km. - Bodindecha 2 School: 1.5 km. - Tesco Lotus Sanitation 1: 2.3 km.